In the 1860s, a British widow, Anna Leonowens (Jodie Foster), and her son Louis (Tom Felton), come to Siam (Thailand) to teach the King’s many children. Anna is completely unaware of Siamese customs, and this causes a lot of friction with her new employer and his family. Louis and Prine Chulalongkorn (Keith Chin) quickly come to blows, and the Prince is not used to having people tell him what to do, let alone a woman. A foreign woman at that! King Mongkut (Chow Yun-Fat) is not a horrible man to begin with, but he’s very set in his ways. Lucky for Anna, not enough set to not want to listen or to bring around some change. For Anna, the new life is frustrating, and being a Christian woman in a land where it’s perfectly okay for a king to have twenty-odd wives just to ensure the throne … it’s very uncomfortable with her. Certain customs is so alien that she feels compelled to protest them. She might be a small woman, but if you think she’s just some meek little governess, you’re in for an almighty surprise! This is a fairly long film, but I couldn’t stop watching it. There’s something special about governesses falling in love with their employer – like Jane Eyre and Sound of Music – and this is based on a true story as well. Anna Leonowens was a real person, and the film is based on her diaries. In fact, it probably has more in common with Sound of Music than Jane Eyre. Near the end, they actually end up getting chased – not by Nazis, but by people wanting the throne of Siam. They don’t flee across the Alps to neutral Switzerland, and the “happily ever after” didn’t work out quite the way I wanted it to, but at the same time, life normally has very little to do with fairytale endings. As for the film, it’s quite lovely. I really enjoyed Anna and her sometimes totally inappropriate westernisms, and the culture clashes it caused, and I liked the King’s calm response to it all. It’s sweet, sometimes a little Cinderella-like (without ugly stepsisters), and the landscape and architecture are both breathtaking. For a romantic story that isn’t a romance, Anna and the King is great. 4 out of 5 white elephants. 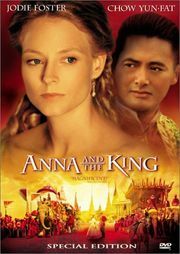 3 Responses to "Anna and the King (1999)"
I enjoyed this movie, but l also loved the original b&w version. Plus I adored the musical version “The King and I” so much so that I even read the book!